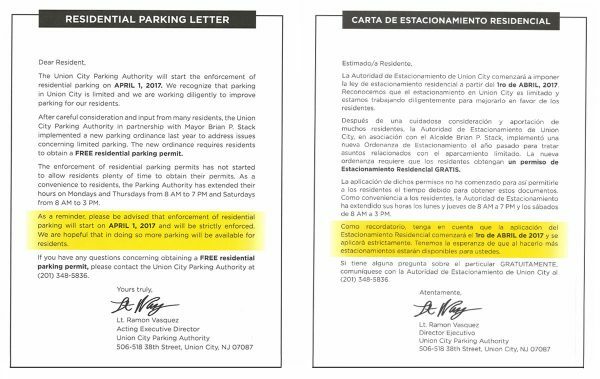 The Union City Parking Authority will start the strict enforcement of residential parking on APRIL 1, 2017, that reflects the new parking ordinance to address the issues with limited parking. The new ordinace REQUIRES residents to obtain FREE Residential Parking Permit. The Union City Parking Authority has extended their hours on Mondays and Thursdays from 8am to 7pm and Saturdays 8am to 3pm, as a convenience to residents. If you have any questions concerning obtaining a FREE residential parking permit, please contact the Union City Parking Authority at (201) 348-5836.